Lay the first cookie down flat. Then take a candy corn, dunk it in the chocolate, and set it in the hole to brace the second cookie. Let it harden. 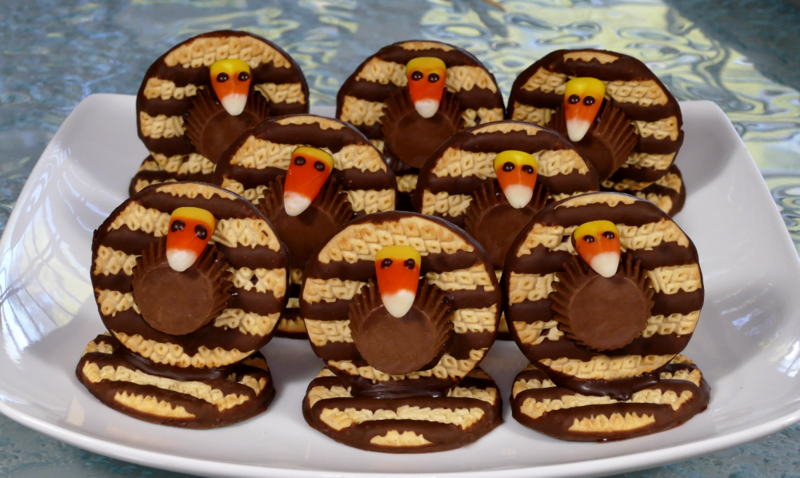 Dip the bottom part of the second cookie in chocolate and then set it upright against the candy corn. For the body, dip the large side of a peanut butter cup into the chocolate and attach it to the cookie. Make the face with a second candy corn. Dip the backside of the candy corn in chocolate and lay it on the peanut butter cup. Finally, take a toothpick and dip it in chocolate and dot your eyes! Let harden.